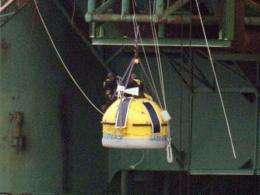 Police from the Knud Rasmussen Danish warship remove Greenpeace activists and take down the Arctic survival pod from the 53,000 tonne Leiv Eiriksson oil rig. Eighteen Greenpeace activists who scaled an oil rig off Greenland to protest oil prospecting in the Arctic were on Saturday arrested by police, the environmental group said. Eighteen Greenpeace activists who scaled an oil rig off Greenland to protest oil prospecting in the Arctic were on Saturday arrested by police, the environmental group said. The arrests brought to 20 the number of militants detained over their attempt to disrupt drilling for oil 180 kilometres (110 miles) off the western coast of Greenland for Scottish company Cairn Energy which is due to start soon. Earlier Saturday local police in Greenland, which is a semi-autonomous Danish territory, said they arrested activists who had climbed the 53,00-tonne Leiv Eiriksson platform. Four barricaded themselves in cabins located in two cranes of the platform, initially frustrating police efforts. The 18 activists will be transferred to Greenland's capital Nuuk, where they may be charged with trespassing and entering a restricted security zone, Norwegian news agency NTB said. On Thursday 25-year-old activists Luke Jones from Britain and Hannah McHardy from the United States were arrested after they spent four days hanging in a "survival pod" beneath the drilling platform. They were also being detained in Nuuk. Cairn has said it was seeking a court injunction in the Netherlands against Greenpeace and the owners of its ships the MS Esperanza and the MS Arctic Sunrise. In August 2010, four Greenpeace militants disrupted oil drilling for Cairn off Greenland for 40 hours after occupying an oil rig there. They were later forced to interrupt their action due to Arctic conditions. Greenland depends on oil exploitation to ensure its economic independence. The Arctic holds 90 billion barrels of oil and 30 percent of the world's undiscovered natural gas, according to US geological experts.